When the team from the country club came on the scene of the show "Ukraine got talent", nor jury, nor the audience does not believe in success. How can you expect creative ideas from the provincial folk ensemble? The first bid for victory was the name "Lisapetny battalion" — the artists will not be denied in originality! These not young women sing and dance with weird energy... the lyrics touch the soul — this concert not to be missed! Bright and vivid rural flavor is embodied by vociferous and fervent ladies, which, despite the longstanding years, demonstrate such dance numbers that never dreamed of young girls. 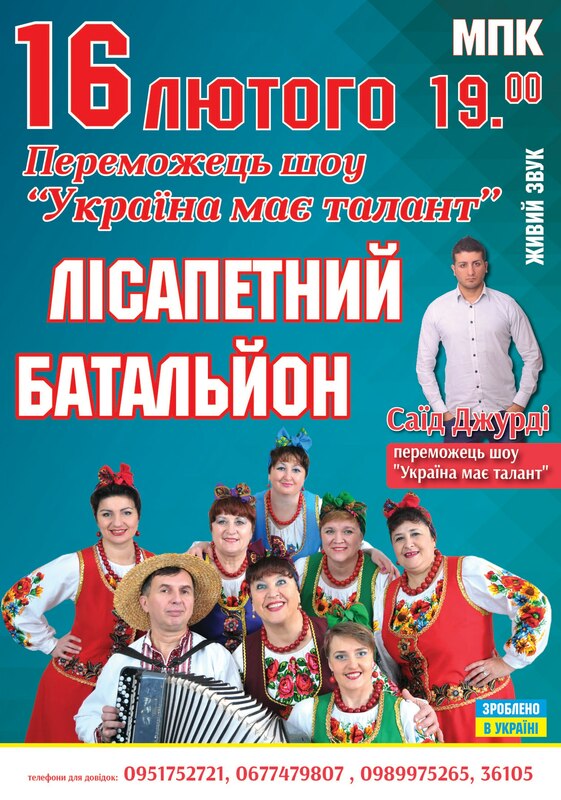 The average age of the ensemble “Lisapetny battalion” participants is highly respectable, but who would have thought that women from the Ukrainian heartland will win in the prestigious competition “Ukraine's got talent” 2013 with huge enthusiasm and comic repertoire? However the audience and the jury were unanimous: such songs and dances deserve a prize in one million! The “ringleader” Natalia Falion and her spirited team liked to be it on stage that so much, and now the ensemble travels with concerts across the country. In whatever town there was a poster of “Lisapetny battalion”, there is no doubt that the success will be provided. Now a rare occasion of regional or national importance is complete without show of cheerful performers the “sharp-tongued” rural chanson. As part of the spring tour on April 7 true people's talents will visit the Ukrainian capital.